We all have busy lives but please take a moment to stop and reflect on the sacrifices so many Canadians have made to help make the world a better place. Speak with the young people in your life about the importance of this date and what it means to your family and our country. 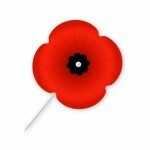 Encourage wearing a poppy by wearing one yourself. Mather Arch Cenotaph – 11:00 a.m.
Ridgeway Memorial Cemetery Cenotaph – 11:00 a.m.
Stevensville Memorial Hall – 2:00 p.m.